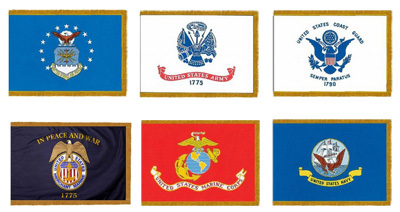 Flags are made of all-weather nylon with flannel-lined pole sleeve with Velcro® mounting tabs. Golden yellow fringe on three sides. Made in the USA. Use the buttons below to select Branch of Service and Size. 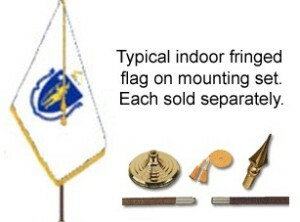 Click here for mounting sets for indoor fringed flags. 12″ x 18″ Coast Guard flag stapled to a 30″ x 3/8″ diameter natural wood staff with gilt spear tip. Made in the U.S.A.
3′ x 4′ Air Force Retired flag. Outdoor 200-denier nylon flag with white canvas heading and two brass grommets. Made in the U.S.A. by Annin Flagmakers. 3′ x 4′ Army Retired flag. Outdoor 200-denier nylon flag with white canvas heading and two brass grommets. Made in the U.S.A. by Annin Flagmakers. 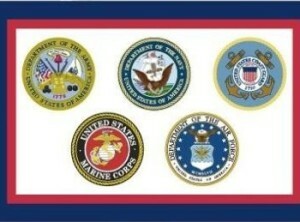 3 ft x 5 ft Armed Forces flag, featuring the logos of the Air Force, Army, Coast Guard, Marine Corps and Navy. Outdoor 200-denier nylon flag with white canvas heading and two brass grommets. Made in the U.S.A. 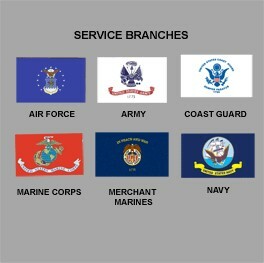 Mounting set includes 9 ft x 1-1/4 in diameter two-piece dark oak flagpole with brass screw joint, glossy gold ABS stand, glossy gold ABS spear ornament and 9 ft yellow-gold cord with tassels. 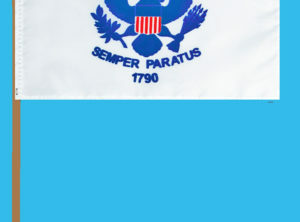 For use with a 4 ft x 6 ft sleeved indoor flag (flag sold separately).